This will be effective on Feb. 1, 2019.This will be implemented every weekends, holidays and long weekends until the month of March. Hence,this shall not include weekdays ( Sunday – Thursday ),this will be on regular rate. 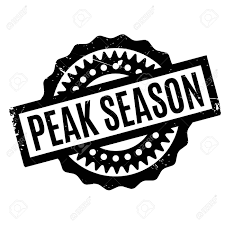 However, on the months of April and May, peak rates will be fully implemented daily from Monday – Sunday. Date: June 19, 2018 Author: Holiday Park Hotel Categories: NewsNo comments yet. Date: July 4, 2017 Author: Holiday Park Hotel Categories: NewsNo comments yet. Date: July 15, 2016 Author: Holiday Park Hotel Categories: NewsNo comments yet. 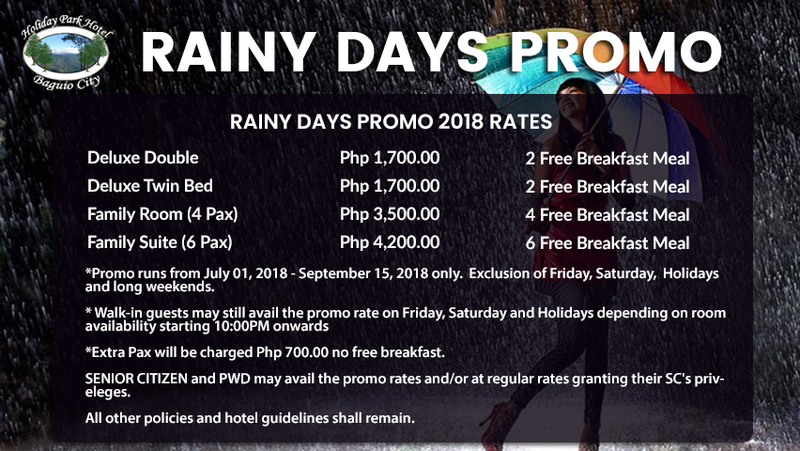 Our Rainy Days Promo is Back! Date: June 22, 2016 Author: Holiday Park Hotel Categories: NewsNo comments yet. Exclusive of Friday, Saturday and Holidays. Since February 2008 our regular rates has remain unchanged. Thus it is only timely that by 2015 we introduce our new rates. New rates will be inclusive of breakfast. The free breakfast allotment will be based on the number of persons in a room not exceeding the maximum occupancy. Holiday Park Hotel Launches a new website! Date: December 18, 2013 Author: Holiday Park Hotel Categories: NewsNo comments yet. The new look website is sleek and stylish and is full of new features, new imagery and a interface that improve user experience. 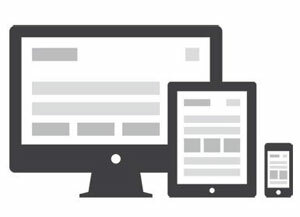 The new site is now mobile ready which makes the site user-friendly to customers who uses smartphones or tablets for browsing. It also includes Social Network integration which encourages more user interaction and sharing. The website’s new features include an improve image gallery and booking form, a live weather update so guests can know what to pack for their stay, and a news section featuring the latest hotel updates, events and promotion. The new site is also integrated with the TripAdvisor forum widgets so that past and present guests can keep in touch and pass on handy hints and tips to each other. It’s that time of year again where Christendom celebrates the Holidays. No matter what tradition one upholds during this time of year, it is guaranteed to be a time of building memories. 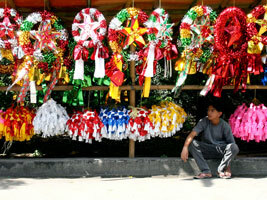 And in Baguio, where the temperature drops to more than below 16 degrees Celsius, it adds a little more flavour to this season than any other place in the country. Holiday Park Hotel is just the place one can enjoy a simple yet memorable experience while spending the Holidays in Baguio, which is perhaps why, by some coincidence that the hotel is aptly called “Holiday Park”. Our gift to our guests is the experience of a stay that is rich, personal and warm. Free from the complexities that often shrouds the true Spirit of the Season, but rather offering sincere pleasantries one would come to expect from a place aimed to be a “home away from home.” So build your memories this Christmas with us, here at Holiday Park Hotel. Date: June 11, 2013 Author: Holiday Park Hotel Categories: NewsNo comments yet. 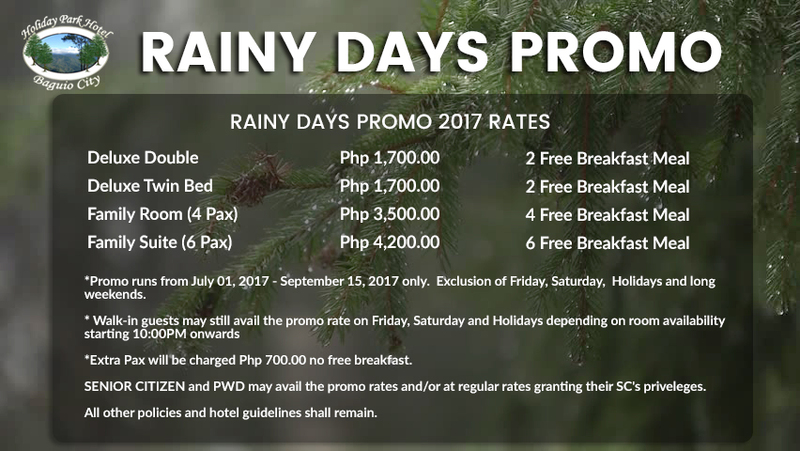 Holiday Park Hotel has been cited as the no.1 value hotel in Baguio by Tripadvisor.com, and now with the return of this year’s “Rainy Days Promo” guests will experience even more value for their money. 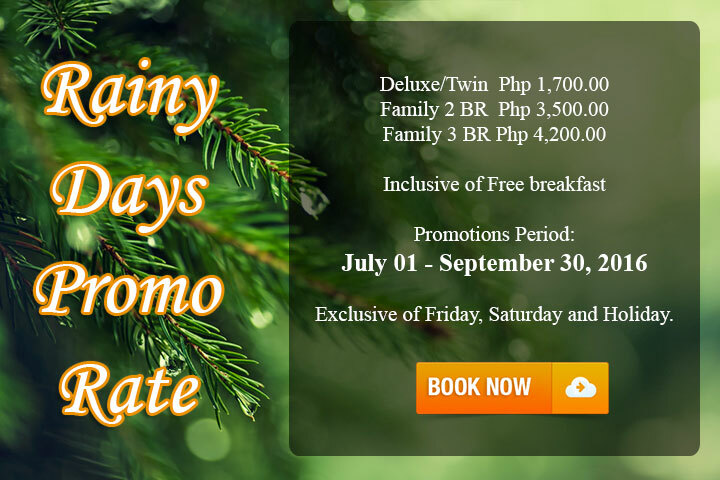 From July 1 to August 31, 2013 avail of discounted room rates which is now inclusive of breakfast. A deluxe room is only at 1,500Php; our 2 Bedroom Suite at 3,200Php and our 3 Bedroom suite at an amazing 3,900Php. Make your reservations now! Breakfast allotment is per person not exceeding maximum occupancy of room type. 1. Deluxe Room-maximum of 2 breakfast, in the event that only a single person occupies the room he/she is only given 1 breakfast and can not claim 2. Extra persons paid for the Deluxe will pay 100 for their breakfast, this includes children below 10 years old. 2. 2 Bedroom Suite -maximum of 4 breakfast, in the event that there are less than 4 that occupies this room they are given breakfast according to their number but and can not claim additional to complete 4. Extra persons paid for the Deluxe will pay 100 for their breakfast, this includes children below 10 years old. 3. 3 Bedroom Suite -maximum of 6 breakfast, in the event that there are less than 6 that occupies this room they are given breakfast according to their number but and can not claim additional to complete 6. Extra persons paid for the Deluxe will pay 100 for their breakfast, this includes children below 10 years old.